Hi new to the forum. I have a Kodiaq Edition (7 seats) 2.0 TDI 190 PS 4x4 DSG, just wondering what MPG I should be expecting, I have an average foot not too heavy lol. I realise that published car data especially Mg are under extremely ideal conditions, so I was just wondering what real life motoring may bring. What sort of length journeys are you doing? I find the 190 takes around 10 miles to warm up properly, and MPG improves considerably once warm. I am getting mid to high 40s on longer journeys (25 miles and more), with the occasional venture into the low 50s if conditions are right and I try. 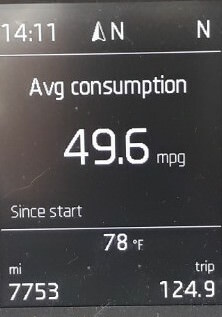 My long term average after 2000 miles is now up to 44mpg. If you do lots of short journeys and lots of accelerating and stopping, you will get much poorer results. 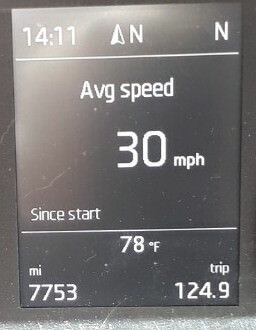 My long term average (over 6000 miles) is 35mpg. And motorways at 80ish mph. I’m more than happy with that for a two ton car. I've split my mpg between 1st 5k for running in and post 5k as until around the 4k mark it was woeful. I remember driving home from the stealers I got 33mpg on the motorway thinking I'd bought a lemon! Getting low 40s now on my 23 mile commute, 19 of which are motorway, which is better than my old A5 Cab 170 TDI. My recent trip to Poole only saw 42, but that was with a fully loaded boot, roofbox, SWMBO & twins, and once you leave the M4 there are a lot of hills to get caught behind a wagon on. Previous week we went to Thomasland, 130 miles each way and got 49, no roofbox but similar boot usage. Normal week for me is commute 2 times a week & 1 longer run over the weekend and 4 days around town. I've found sport mode on the DSG is better around town than Drive, my theory is due to the higher idle revs in sport you're off throttle more, so fuel cuts off sooner, hence better MPG. Hi I have covered 5k since March and reckon high 40’s is quite attainable, regular Glasgow to Liverpool run is 51 and best is Tain to Ullapool stop start with passing places see photo from midway point. Keep speed warning at 85 and accelerate slowly the engine is really pleasant to drive around 1500 revs. 150 SEL diesel manual awd 7seater business grey with spare. I believe we have exact same car as you, apart from ours being only a 5 seater, in our first month we seem to be averaging around about 40-ish mpg. It seems to be around 35mpg for normal driving about town, school runs etc. and 45 mpg for longer runs, we don't do much motorway driving but I assume that would push average up again even further? In general we use Eco mode, are we wrong to be doing this, does it not really make much difference to mpg?